In this plan your stake depends on odds. The bot lays specific Percentage of your Stake, depending in which range current Odds lie. Stake is amount to bet. 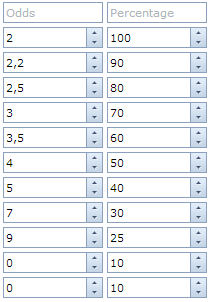 Percentage in the table defines percentage of Stake to lay in the specific Odds range. Also it’s possible to specify amount to bet as Percentage of Bank. Then your Stake is actually a percentage of your bank. For example if bank is 1000.0 and Stake is 2.00, then amount to bet will be 1000.0 x 2% = 20.0. As you can see bets above 9.0 will have 10% of Stake.